DETROIT -- Ford Motor Co.'s namesake brand will top 2 million vehicles in U.S. sales this year and its Focus compact car was the top-selling model line worldwide through September, the automaker said. Ford will be the only auto brand to exceed the 2 million sales level in the United States this year, the company said in a statement. After Ford, the top-selling brands in the U.S. market this year are Chevrolet, Toyota, Honda, Nissan, Hyundai, Kia, Dodge, Jeep and Volkswagen. Ford models are on track to reach 2.2 million U.S. sales, up from 2.1 million last year, said Erich Merkle, the company's sales analyst. It marks the second straight year the No. 2 U.S. automaker has surpassed the 2 million threshold. But the company has acknowledged losing market share as it struggled to keep up with consumer demand. Ford Motor Co.'s U.S. sales have increased 5 percent to 2.03 million this year through November, while the overall U.S. light-vehicle market has advanced 14 percent. As a result, Ford Motor Co.'s share of the U.S. light-vehicle market has slipped 1.3 percentage points to 15.5 percent in the first 11 months of 2012, compared to 16.8 percent in the same period of 2011. The projected sales jump for the Ford brand falls short of the overall industry's gains, which many analysts expect to exceed 13 percent in 2012. Automakers are scheduled to report December U.S. sales results on Thursday. Ford Motor Co.'s share of the U.S. light-vehicle market has slipped 1.3 percentage points to 15.5 percent in the first 11 months of 2012, compared to 16.8 percent in the same period of 2011. Earlier this year, Ford said it expected to lose market share in the United States because it could not build enough cars and trucks to satisfy consumer demand. Consumers also are buying fewer pickup trucks than in past years. Ford CEO Alan Mulally is trying to boost profits by selling the same models globally, rather than different versions for various regions. His One Ford strategy aims to leverage the second-largest U.S. automaker's economies of scale to improve profit margins. Ford earned $4.07 billion in the first nine months of 2012, down from $6.6 billion a year earlier as losses overseas dragged down profit. "Over the last three years, we've been moving toward global vehicles," Merkle said. "And it's playing out very well here in the U.S., where the Focus will be up 40 percent this year, and in Asia, where Focus is one of the best- selling vehicles in the region." Including its Lincoln luxury line, Ford will remain the second-best selling automaker in the U.S. for 2012, behind General Motors, Merkle said. GM, with sales up 4 percent through November, is also on track to lose U.S. market share this year. While Toyota Motor Corp. has narrowed the gap with Ford this year, the company trailed Ford by 141,746 cars and light trucks through November. In addition to the Focus, Ford said its F-Series pickup line is the world's fourth-best selling nameplate and its Fiesta subcompact ranks fifth. 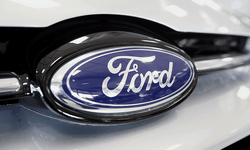 Ford cited registration data gathered by auto researcher R.L. Polk & Co.
"Focus and Fiesta represent the best of our One Ford plan," Jim Farley, Ford's global sales and marketing chief, said in a statement. "In just three years, Ford has transformed our global small-car lineup." Ford said no other auto brand has topped 2 million in sales in the United States since 2007, before the U.S. economy plunged into a recession. "Before the recession, 2 million in sales was fairly common," Merkle said. "After the recession, of course, that all changed. We're the first one back to pre-recession levels."